Conceived as a unitary cycle from as early as 1528, the decorative scheme for the presbytery features four canvases executed by Tintoretto at various different points of his career which narrate the final episodes in the life of the titular saint. The first canvas, painted in 1549, is the majestic St. Roch Healing the Plague-Stricken, the first depiction of the plague in Venetian art, an extraordinary work with the dramatic setting of the interior of the pest house rendered even more striking by the double light source, created in the background by flaming torches and in the foreground by an improbable band of light flooding in from an unknown lateral source. In this picture, which marks the real beginning of his engagement with the Scuola, the young painter breaks new ground with his conception of a nocturnal interior, arrestingly cut through with artificial light. For reasons we do not know to this day, work was suspended at this point and not until 1567, after having completed the paintings in the Sala dell’Albergo, did Jacopo return to the chancel. Most probably the first canvas executed in this second phase wasSt. Roch in Prison Visited by an Angel, where once again the scene is transfigured by a strong chiaroscuro, underlining the contrast between the radiant irruption of the angel sent by God to comfort the dying saint and the dark anguish of his surroundings. The other work from 1567 is St. Roch Blessing the Animals, a more naturalistic treatment, in which however a certain qualitative falling off is discernible, perhaps due to the intervention of other hands or damage sustained over the centuries. The fourth canvas, on the other hand, can be dated to the first half of the 1580s, and represents The Arrest of St. Roch, in which the plasticity of the foreground – where, off to the left, the saint is being forcefully dragged off by soldiers – is effectively contrasted with the evanescent and spectral rendering of the battle raging in the background. In 1937 the picture was moved to the right-hand wall of the nave, thus depriving it of its original narrative positioning immediately before that of the saint imprisoned, and disturbing the rationale of the chancel’s iconography. In its place in fact we now find the so-called St. Roch in the Desert, a work datable to around 1580 on the grounds of affinity to the canvases in the Sala Capitolare of the Scuola, but not mentioned in the sources. 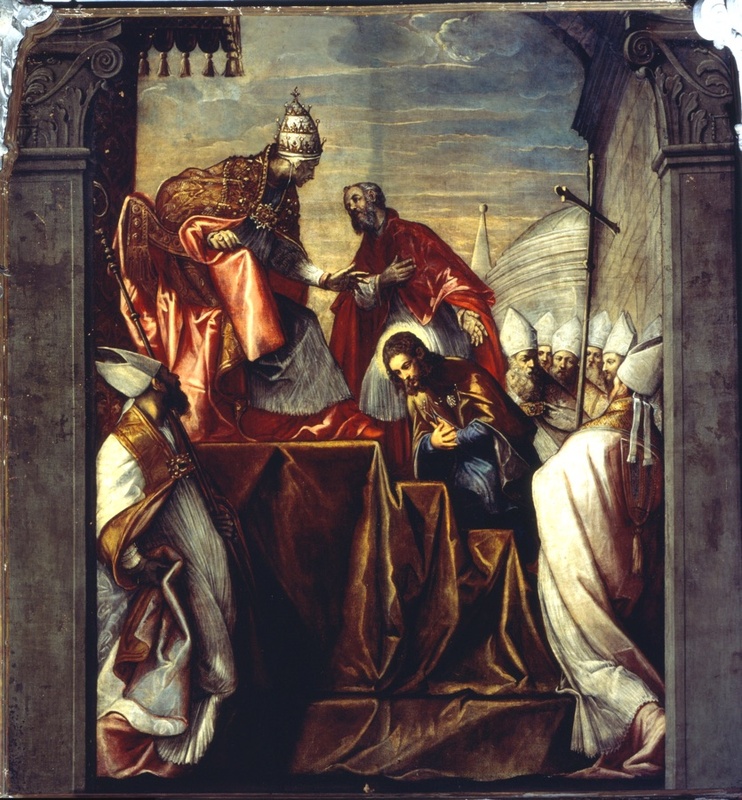 Probably only the compositional arrangement and the figure of the saint are from the brush of Tintoretto himself, while the landscape has been attributed to Paolo Fiammingo and the two lateral groupings were added by Santo Piatti in 1729, at the time of its previous hanging on the upper part of the right-hand wall of the nave, where it functioned as a counterpoint to the pictures by Il Pordenone on the opposite wall, which contained similar groups of supplicants, paupers and the sick. Now hanging in the middle of the right-hand wall of the nave, this large canvas, painted by Tintoretto in 1559, at one time adorned the doors of a large cupboard for storing silver, which was intended to accompany another painted with gigantic figures of St. Martin and St. Christopher by Il Pordenone for the church earlier in the sixteenth century, from which Jacopo borrowed the architectural framework and the bold compositional structure. In 1674 the cupboard was eliminated and the two parts of the painting sewn together. Subsequently, following alterations to the nave, Santo Piatti was tasked in 1729 with adapting the picture to its new position on the right-hand wall, where it has remained. His additions were then removed during a 1937 restoration at which time other portions of the work were also destroyed, being wrongly supposed not to be original. None the less, despite these vicissitudes, the quality of the canvas is still evident in the magisterial composition and the impassioned dramatic tension the painter achieves in his narration of the miraculous event. 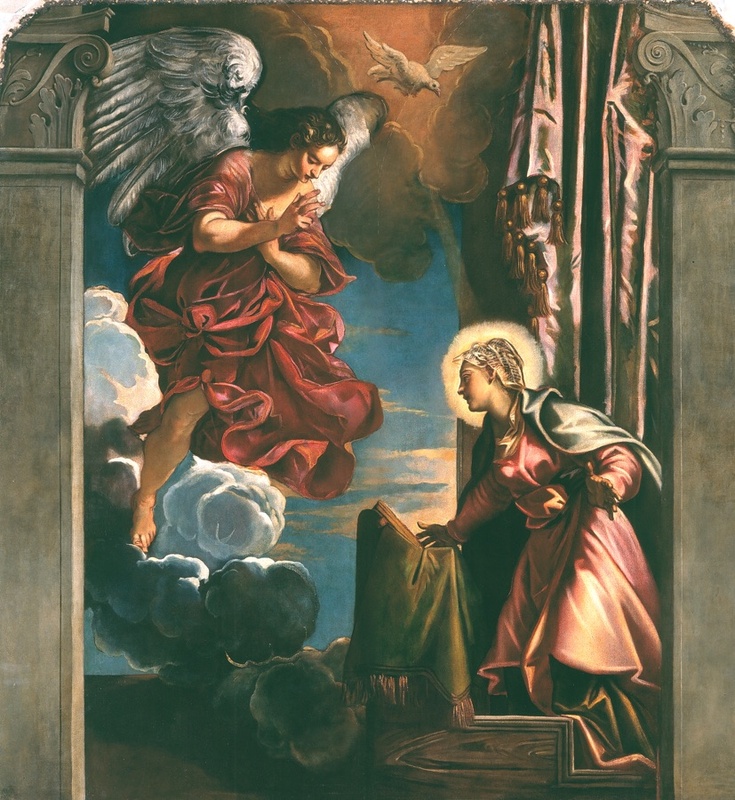 The story of St. Roch’s pilgrimage concluded on the doors of the old organ, painted by Tintoretto in the first half of the 1580s, which featured on the outside the saint’s visit to Rome (St. Roch before the Pope) and, on the inside an Annunciation. Reduced to separate panels, with additions by Santo Piatti (1738) and remounted on the inside wall of the façade at either side of the marble choir of the new organ loft, they are relatively weak studio works. They were taken down a few years ago, on the occasion of the erection of a late eighteenth century moveable choir, and are currently in storage at the Scuola. The Arrest of St. Roch, oil on canvas, first half XVIth c.
St. Roch before the Pope, oil on canvas, first half XVIth c.
Annunciation, oil on canvas, first half XVIth c.